I just spotted this bird in my garden,actually I heard him first, tapping away at the banana tree. 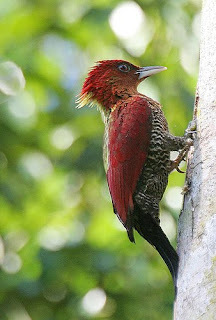 I looked him up in my Birds of Penninsular Malaysia and Singapore and, yes, he is a banded woodpecker (picus miniaceus) and is "found in plantations and sometimes enters rural and suburban gardens". He looks quite exotic to me, but is actually quite common it seems. Unfortunately I couldn't get a photo, so had to grab one from flickr, but this is one thing I love about Singapore; being able to spot wildlife right in my own home. We have many birds Chip Bee, but I have never seen this one before. I stood watching him for a while, as he tapped the dead branches of the tree looking for insects, and felt glad I didn't live in an apartment in the sky.